As the largest backpack Red Rock Gear make, the Diplomat Backpack has enough storage to hold everything you’ll need for 72+ hours. The main compartment features a wrap-around zipper to open completely for unhindered access to two quick-release gear straps and a large mesh pocket. The secondary compartment contains admin organizers and divider sleeves, as well as a pleated external pocket. Three utility compartments (one below the secondary compartment and one on either side of the pack) adorn the exterior of the bag and are clad in MOLLE webbing. The padded back panel has a zippered closure for storage of a standard laptop or a hydration bladder (hydration bladder sold separately). This pack has four compression straps, three reinforced drag handles, and three hydration tube port holes. 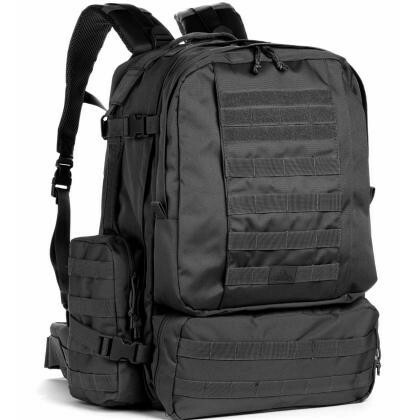 Red Rock Gear's Diplomat Backpack is the ultimate bug-out bag or three-day bag.